Need some inspiration to ring in the New Year? Why not escape the crowds, the fireworks and the parties with a quiet, romantic glamping getaway just for two? Our top picks below are just a small sample of the best shepherd's huts in the UK that you can snuggle yourself away in on New Year's Eve. And the best bit is that all have availability for you to book right now! With exquisite views across the surrounding Kent Downs, Greenhill Glamping sets itself apart form other glamping sites with its romantic marriage of old, vintage style and tasteful, modern restoration. The authentic 1890’s shepherd’s hut has a rich history quite literally written on its walls, with etchings in the wood from former occupants, while interior fittings have been carefully chosen to provide an antique finish. Bronze fittings, a wood-burning stove, and original wood panelling create an atmospheric environment, while an en-suite shower room reveals a more practical, ergonomic side. Outside, you can head straight onto the footpaths or drive the 10 minutes to Romney Marsh and the south coast. There are several shepherd’s huts at Blackgrounds Farm but, with each in their own private area of the vast Oxfordshire farmland, you feel like the only guests on the site. Each hut has its own private (but separate) bathroom, while inside the huts have a more traditional, pared back appearance. Interior furnishings differ slightly across the five huts, but features include the likes of a kettle and fridge, a wood-burner to keep you warm and an additional electric heater. All have deep double beds and a quiet location on the farm, whether it’s the hut nestled in the apple orchard, or the riverside hut on the banks of the River Cherwell. It’s less than half an hour to ‘the city of dreaming spires’, where you can roam Oxford's various colleges and quads, admiring the distinctive architecture. On the fringes of the Highlands and the edge of the Cairngorms National Park, Ecocamp Glenshee boasts a pair of shepherd’s huts with expansive views across the open fields to where the mountains begin to climb away into the distance. Cross-country skiing is available directly from the campsite (if there’s enough New Year's snow), while it’s a short drive to some of the more managed ski areas on higher ground within the national park. Huts are suitably insulated and have log-burners, while a cosy campsite bothy always has a fire going and provides a great communal space for meeting other glampers. Other onsite fun includes, geocaching, llama trekking and feeding the animals – hens, goats, donkeys and lamas. Hale Farm shot to fame as one of the best pop-up summer campsites in the south-east of England but for most of the year it’s a single, cosy shepherd’s hut that occupies the camping meadow. The result is acres of space all to yourselves and a location that is lorded by many every year for its beauty and seclusion. 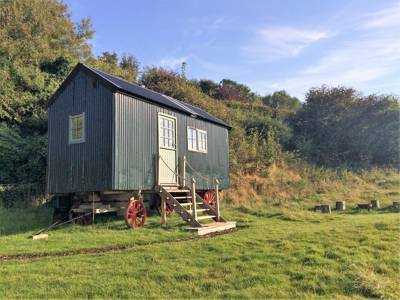 Halfway between the High Weald and the South Downs, the shepherd’s hut has an ideal location for enjoying the south-east, while the structure itself is a genuine 19th-century shepherd’s hut that has been tastefully restored both inside and out. It features a full-size double bed and a fitted kitchenette, plus a toasty wood-burning stove that warms its wooden interior into a couples’ cocoon of loveliness. Though it came to our attention as a yurt glamping site, Glamping West Midlands also boasts a traditional shepherd’s hut in its own quiet corner of the farm. While inside it features a comfortable bed, table and chairs, it’s outside that there’s some real New Year's Eve luxury – a wood-fired hot tub where you can toast in 2017 with some bubbly. If you’re not steaming beneath the stars, the campsite offers ample space to explore – footpaths and bridleways run directly from the farm – while animals to pet include the likes of horses, ponies and lamas. One of the newest additions to the Cool Camping website, the shepherd’s hut at Little Oldwick Barn is one of the most beautiful huts we’ve discovered this year. Inside, the fitted double bed is accompanied by a wood-burning stove, a kitchen area with a classic wooden finish and deep Belfast sink, plus an en-suite shower room. Every attention to detail has been given to create the perfect finish, from the bronze vanity mirror in the en-suite, to the painted mural on the ceiling of the hut depicting scenes from nearby Chichester Harbour and the rolling hills of the surrounding South Downs National Park.